Planning on visiting the famous birthplace of Paul Bocuse and his food market? Need a place to stay? We’ve got some tips for you. This is Lyon has curated a selection of our finest and most charming hotels amongst our accommodations list. Whether you’re on a business trip and looking for a luxury hotel with a breathtaking view, a unique boutique hotel, or simply backpacking through France with your family and would like a hostel, this is the guide for you. We’re giving you the rundown on practicality (SNCF station hotels or hotels close to the airport, for example), the best deals and prices, location (Confluence, Perrache, Part-Dieu, Vieux Lyon also known as the “old town”, etc. ), and all the offered services (such as free parking, Wi-Fi, room service, privacy policies, and it being pet-friendly). 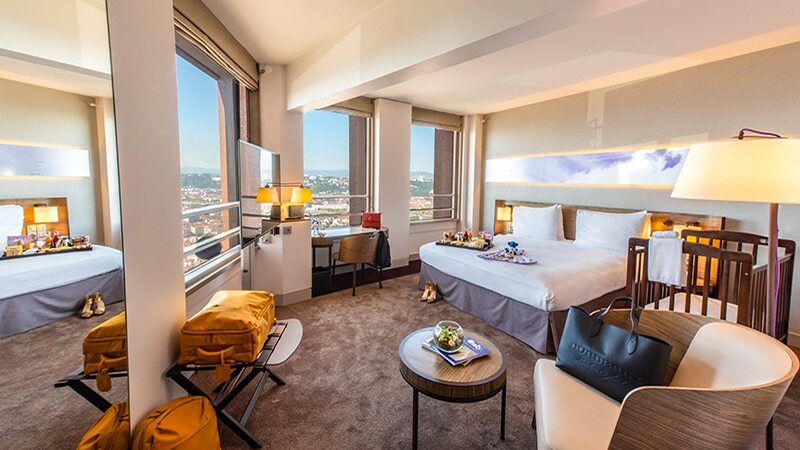 You’ll be able to learn how to manage your bookings and room rentals no matter the occasion or the season, as well as review, compare and contrast the best hotels in Lyon. Lyon is a very welcoming and traditional city but it is also the second largest in France, ever-evolving with new developments every day, home to an important business district. This makes for a certain level of sophistication which definitely translates in Lyon’s luxury hotels. Stunning views, perfect locations, efficiency and staff dedicated to making your life easier during your stay here: you’ll find all of this and more in the following article. France is known for its picturesque cities and Lyon is no exception. It is full of quirky, unique spots and gorgeous sights: this makes it the perfect city for boutique hotels. Smaller or bigger budgets: there is something for everyone when it comes to these intimate, original options. Lyon can certainly feel big and modern but do not be mistaken: it is also very family and student-oriented. We’re all about good food and fun times! With that in mind, there’s no shortage of more budget-friendly booking options. Here is our selection of hostels where you can comfortably rest your head in the heart of Lyon, among its various activities, as a lone backpacker, a student, or with children.